Matt Murdock is nothing if not dedicated to his craft. Low-powered and forced to rely mostly on hard-earned fighting skills, he can’t afford not to learn from past battles and strive to constantly improve himself. 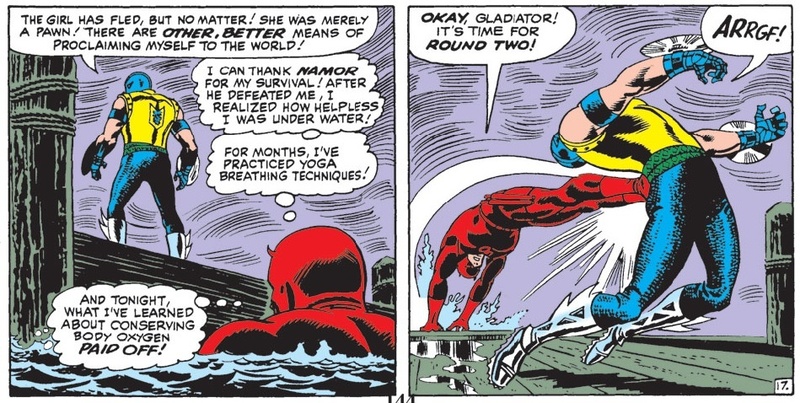 In this panel below on the left, from Daredevil #18, decades before the ninja training with Stick and all the other martial arts voodoo, we learn that Matt practices yoga. 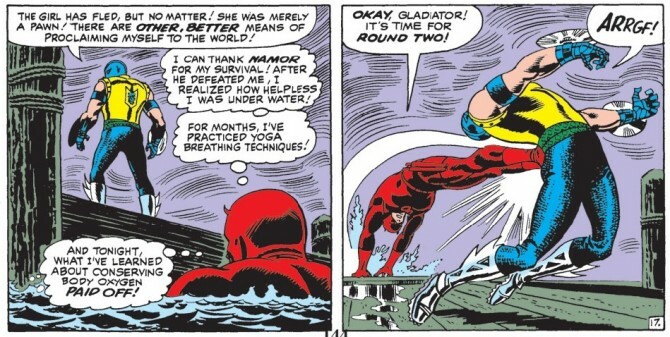 After his close brush with death against Namor in Daredevil #7, he realized that not being able to breathe under water is a bit of a hassle. Most of us would just give up at this point. But that’s not Matt Murdock’s style. He practices oxygen-preservation techniques instead. And may I add that this was long before yoga was even popular. Heck, it even predates the Beatles going to India. Kudos to you, Mr. Murdock. Heh. we should be thankful! Imagine if “The Man” had instead the idea of having him use a “billy-club’s built-in miniaturized rebreather with mini oxigen tank”!